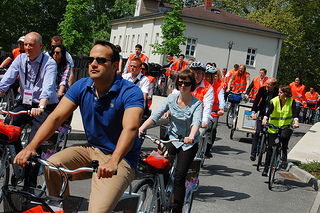 Minister for Transport, Tourism and Sport, Leo Varadkar, has released his list of priorities for 2013 — and cycling is down the list. Varadkar’s department for the first time covers transport, tourism and sport and cycling ticks all three boxes as a mode of transport, a sport, active leisure activity and an attractor for tourists. But cycling comes in 18th of 20th of the minister’s priorities for the year ahead. Complete the merger of the NRA and RPA.